Soldier Of Fortune, Deep Purple and Blackmore's Night. I'm totally into the gorgeous tune Soldier Of Fortune, by Deep Purple, originally - but not the original version of Deep Purple, more, you know...the David Coverdale version of Deep Purple. Not that there's anything wrong with David, he's a pretty decent vocalist - he can sure sing better than I can; and before folks started calling him a Robert Plant clone he was already a great vocalist and a writer that came up with some pretty good tunes here and there as well - one of those, the best one that I know of was...of course, Soldier Of Fortune. In fact, I'm betting that that's a song that will not only last, but pass on into some sort of future English Folk Tune....and likewise, and American one as well. And that's all well, good, pretty, and cool - but it's absolutely nothing on the version by Blackmore's Night; and that's because Candice Night is all that and then some - at least she was when they recorded the following. That Woman's just pretty, and can sing very well, surely you would agree? I'm thinking that the guitar Blackmore uses in this is a hollow body electric of a design that I've not seen before. It's a very clear and acoustic guitar sound he's getting here. The thing makes me think of some sort of Ovation guitar. I don't see a sound hole, but that doesn't mean that there's not one on that thing somewhere. In other words I'd like to find out what the guitar he's playing here is. "I am a flamenco player. I travel around the whole world giving concerts. So when I meet musicians anywhere, I want to know what they are doing, what music they are playing. I want to make music with the ones that interest me - so I make fusion music in the natural course of my life. I have played with many fusion artists in this country and this experience has been good. But flamenco music is my way of life, and it is the root of my music feelings. I have not the capacity to learn another culture's entire music, even if I wanted to. I must be very careful about what elements I bring from around the world to flamenco, because my music must be flamenco. This music is in our lives everywhere. I go to a party with you in America, and there will be many people there drinking and talking. Thirty conversations going on in the same room all at once! Such confusion! In my village at a party we would play music, and all those who wanted to would play, clap, sing, or be with us in some way. Everyone in the room would be in the SAME conversation. . ."
Paco de Lucía was born Francisco Sánchez Gómez in Algeciras which is a town in the Spanish province of Cadiz, and he was born on the twenty first day of December, 1947. His father introduced him to the guitar at a very young age, and it has been said that he was forced to play for up to twelve hours per day during his youth. Whether or not that was a healthy thing or not I will not debate - but what I will say is that it has certainly paid off for the music world, and provided Paco with the preeminence that he is renowned the world over for. "...a virtuoso was, originally, a highly accomplished musician, but by the nineteenth century the term had become restricted to performers, both vocal and instrumental, whose technical accomplishments were so pronounced as to dazzle the public." Your school is the music around you, made by the people you see, the people you make music with. And, as it is in any music, the great ones will spend some time working with the young players who show special talent. you must understand that a Gypsy's life is a life of anarchy. That is a reason why the way of Flamenco music is a way without discipline, as you know it. We do not try to organize with the mind, we don't go to a school to find out. We just live, and as I said before, music is everywhere in our lives. Flamenco music is a style with huge variations, improvisation, and complex rhythmic patterns - especially for persons in the USA who were raised on the mind toxins on Rupert Murdoch owned FM radio stations. 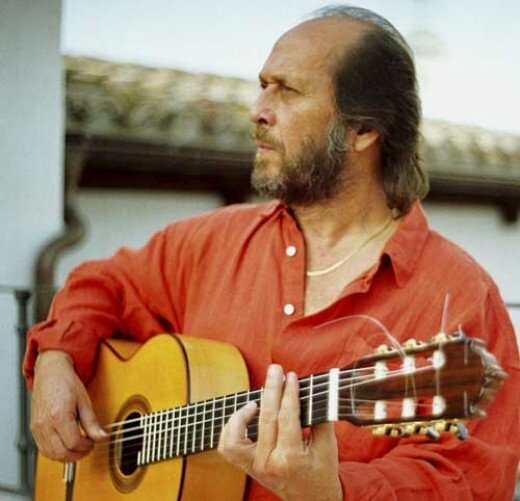 Comparing the Flamenco of someone like Paco De Lucia to American pop music is like comparing the space shuttle to a bottle rocket. American popular music is pathetic already - but when you compare it to someone that spent twelve hours a day learning during his youth, and was born with spectacular talents to begin with - well, if you've read this far, you get the picture. What is so very interesting about all of this is that music is something that the irrational crowds of people that claim to be "rationalist" are trying to analyze it all and boil it down to some sort of math or science - now, it's not a problem when a man or woman tries to learn and understand a thing, what becomes a problem is when they try to explain a spiritual experience such as music with human kind's dry science. Science is always there, and can always be used to describe how things work, or how things happen - but it's just a rote, mechanical dissertation on the mechanics of a process or processes that are beyond the realm of humans. Music is spiritual in nature. Music is communication, and communication not only with other humans, but with God, or God(s) - if you will. It is beyond math and science. ". . . .the old is pure; but the new can also be pure if the feeling is right. Pure music is the music you do with your heart, what you do with your spirit. When you have that, your music will be in good taste. I do think it is important in this time of change that we keep the old music of purity.. . . .if you have not emotion, your music is nothing." The first time that I'd ever heard the music of Paco De Lucia it was with theSuper Trio, and the Album, Friday Night In San Francisco, which I'd borrowed on cassette tape and then made a copy for myself. The music of the Super Trio, which also features Al Di Meola and John Mahavishnu McLaughlin - was so intense for me that it was painful to hear. How could anyone play that fast? Impossible! It's enough to make you want to sell whatever guitars you have right then and right there - no one could ever compare to those three! <----That was my impression. Well, it all starts to make a bit more sense when one realizes that Paco is playing with his entire right hand, really, and not just using a pick. I'm a picker, mostly - but a musician is a musician because he likes music, and not because he or she just likes one kind of music. So I still knock about on the guitar. There's no need to EVER play that fast. Music is to be enjoyed for it's own sake. Music is not a contest - although there are many contest that one may enter. The art form known as flatpicking, i.e., the playing of a steel string acoustic guitar with a pick, and primarily playing either traditional fiddle tune songs on that instrument, or creating songs from the genres of music that had been dominated by fiddles or violins - is not and never was a purely American music form. It didn't even start in America. So far as the past one hundred years are concerned - it was started in Europe, and by a Gypsy Roma Frenchman named Django! But the point of this particular post is to show that what has been a musical form with it's hotbed in Appalachia in the USA, is also very present in all parts of Europe. Today I want to do a bit of promotion or awareness of flatpicking in Italy. The term flatpicking is usually exclusive to steel string acoustic guitars - but playing the mandolin for the same kinds of music could also be considered flatpicking. Jesper Rübner-Petersen - is a new person for me, and I'm pleased to have discovered this man's music from the blog link that I've shared up above! Though the earliest Led Zeppelin albums were recorded before Jimmy Page ever owned a Martin D 28, he did, obviously, acquire one, and you can see it in the beautiful rendition of That's The Way featured up above. No, I don't know much else about it, or his specific guitar, but I recall reading about him getting one in The Hammer Of The Gods, a book that page basically loathed, and didn't approve of in the least. And of course, images of him playing one too. The D 28's, there's more than one, that belong to James Patrick Page are not herringbone D 28s, and that's well and good as Page is a big fan of alternate tunings, and perhaps the herringbone instruments would be too fragile for extended times set at those tunings? I don't know. One must take great care with expensive guitars! And then the guitar in the video up above - I've no idea what that is, but clearly it's a Martin copy of some kind or another, and quite possibly a custom made instrument - a one of, just for Page. Of course That's The Way is hardly the only song that Page made famous with his Martin D 28. Most folks will be familiar with Going To California too, and of course he always finger picked that tune on stage with his D 28. The first song that I'd ever learned to play was The Wildwood Flower. I could not see a guitar in fifteen years, and still pick one up and flub through The Wildwood Flower. Now, The Red Haired Boy wasn't the second song that I ever learned how to play, but it was one of the first songs that I really loved that I could play. This is a song with some true Celtic flavor to it, everyone in the world knows it, and it's never going to go away. It's something with all kinds of ability for interpretation, and should be played using variations whenever possible. You like to state the melody, and then show off a bit with a song like this. Because everyone has heard it already a million times - so you use a song like The Red Haired Boy to show people....you. Now, I can't tell you how much I like this guy, Banjo Ben, because I really like this guy. He's GOOD! Not only can this guy play, he can teach, and he's always got a great presentation put together. Banjo Ben, I friggen salute you! Because The Red Haired Boy is a fiddle tune from the start - you should definitely enjoy hearing and seeing some lovely young women playing it on the fiddle. I could look at and listen to women playing bluegrass all day long. It's just pretty, and it takes talent - there is no getting by via model good looks in Bluegrass - that's what pop and mainstream "music" are for. Would you like the tab and music to Red Haired Boy for guitar? You're one click from it! I can assure you that Banjo Ben was on the money for being a hell of a flatpicker, but one more for the road so far as lesson vids couldn't hurt, could it? I can't claim to play the fiddle at all, and I don't own a mandolin, but if I did own a mandolin - then I'd be able to play the mandolin, at least as well as I can play a guitar. How about some mandolin tab for this one? I don't know if I was eleven years old, or twelve years old - there is no possible way that it could matter at all. I started learning to play the guitar at one of those numerical figures representing age in this particular human being. I strummed chords along behind my grandfather as best as I could. I don't know how he could sing, keep time, and stand all of my fumbling around with the fingers on the fretboard, but he did, and that's how I started off on the acoustic guitar. You always start off with chords - that's just the way that it goes, and that is the way that it should be. If you can't play rhythm, then you have no business playing with other people. What happens if you ignore chord changes is that eventually you turn into what I am now...the guy who is a hermit, lives in a travel trailer, and plays melodies for himself by himself on an acoustic guitar. But of course everyone wants to play leads - the only exception to this is the people who can either sing, or the few people who can play such an exceptional rhythm guitar that they are known for that, and sought after for it - rhythm is an art form every bit the equal to lead playing - it's just not ever as well represented, and it provides you no spot in the spotlight. Seems everything and everyone is trying to shine not for the collective, but rather, for the ego - the spotlight, and this is what's wrong with this world. I've digressed - ego struggling against intent. It never ceases. The first song that I learned to play lead on - the melody of, and independent of anyone else, vocals, or rhythm, was Wildwood Flower, by The Carter Family. 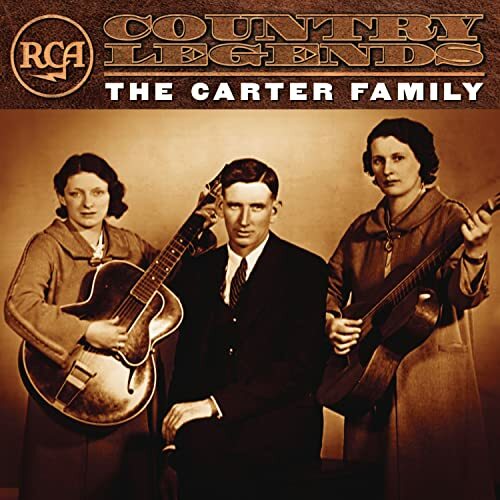 Now, you might think that you aren't familiar with The Carter Family, but you're wrong about that - you know who they are at least because you know who Johnny Cash was. Johnny Cash was married to June Carter Cash, and her Mother - Maybell Carter originally sang The Wildwood Flower. And there you have it, June Carter Cash's mother singing "The Wildwood Flower" - it's only one of the most famous songs in the history of these United States in America. You can't, and you won't find a more familiar song in the US among the educated, the cultured, at least not among the "white folk." Nothing against anyone else - this is just our heritage, and it's not a heritage of hate - it's a heritage of love. This is what we in the South think of when we think of the South, this, and perhaps - chicken fried steak and fried okra - it's things like that, and you Northerners who've not been here are very jaded with your assumptions. You've not been to places like Atlanta, Georgia, or Winston Salem, North Carolina - and you've damned sure not been to Austin, Texas - where San Francisco is considered a conservative city. You see, the arts transcend any prejudice that the non initiate may hold - the arts are completely about the non dying human soul, the spirit of love, and of growth that the atheist who embraces that fairly land non word, that enigma they call "reason" with no definition - the arts transcend cold biology, and there is more under Heaven and Earth, Horatio, than is found in yon philosophy! I've digressed again, please and thank you for the ....need to apologize, or what have you. Let's hear more. The video above is obviously not by a fan of the Carter Family from the Southern US - this shows the trans nationalism appeal of such folk music, obviously, this music was brought here from over seas - no not by the Carter Family, and not the specific tune The Wildwood Flower, but rather, the genre. I very much like the plays on time, and the variations of the melody that this man in the video up above has provided - what he's really provided, however, is that the boundaries of melody that you might have supposed to have existed ....were in your head. They never existed - everything is interpretation in music. So go ahead, learn to play The Wildwood Flower, and learn the traditional version first, then expand upon it and make it your own - perhaps your village or your generation will adopt it as their own. The above video screamed to be put here due to the song title/ post title, and due to the blog title, and guitar used. Black Mountain Rag is one of the most well known flatpicking tunes in the world, and like most all other flatpicking tunes, it was originally a fiddle tune. I could be made as a statement, and be completely factual that flatpicking the guitar came from transcribing and playing fiddle tunes, or music that had originally been composed and played on a fiddle, or violin, on a steel string acoustic guitar. Doc Watson was one of the first flatpickers, and one of the first tunes that Doc Watson made famous on a steel string guitar was Black Mountain Rag. Flatpicking is also, as are the playing of fiddle tunes, something most associated with Bluegrass music, and one of the earliest pioneers of bringing this music to the fore of American consciousness was banjo player Earl Scruggs. So I'm pleased to present to you here his son Randy, who's not been a teenager for quite some time now, but playing Black Mountain Rag as a teen. Now, I've no idea why I couldn't put the video here directly in the usual way except that not allowing me to choose a video by URL here in the settings, but having to search instead....is quite a hindrance. But Doc Watson is directly responsible for bringing the old ragtime fiddle tune in question to the masses, so let's hear Doc Play it! As for me personally, when I did have my fingers to where I could play this well known old fiddle tune - I played it from learning the tab on a book that I bought from Steve Kaufman. Yeah, I put cash directly into Steve Kaufman's hands for one of his instructional books - which he handed me from his other hand. You can do stuff like that at the Walnut Valley Festival. In any case, should you wish to take part in Bluegrass music jam sessions, then this is a tune that you'd really benefit from either being able to play the leads on....or at least knowing the chords to. Let me give you a hint here, if you're going to play the lead parts with folks, then you'd damn well better know the chords as well. Just so that we can equally represent some legends here, let's here Clarence White play the fiddle tune Black Mountain Rag, with The Byrds. So there's some traditional interpretations to Black Mountain Rag, but believe me, you can jazz it up and make it as interpretive as you like, and with any stringed instrument, you may surely do so! Now, there are some great learning tools on the web for playing bluegrass music, and with the following link you can download the tab to The Black Mountain Rag. I have NOT downloaded this, so be wary as you normally would be on the web. Why am I providing a link that I can not vouch for? I've got tab versions and music to this tune already, and I do mean several renditions of it - in magazines. I only wanted to provide the searcher of the web here with an option. The site looks reputable, and none of my bells and whistles or internet security stuff has made a peep from me viewing the site. I'm 99% sure it's all good, and when I find a direct link to tab view able on the page for The Black Mountain Rag, I'll update this. If you are interested in these subjects of fine acoustic guitars, or flatpicking acoustic guitars, or if you are just a fan of acoustic guitar music - then Flatpicking Guitar Magazine Online is definitely a website that I would recommend to you. It's a social networking site, where you can interact with persons who are into playing steel string guitars with picks, or plectrums, and who do so playing all kinds of music. It should be obvious, however, that most flatpicking is going to be centered around the type of music that originated the genre, and that's folk, bluegrass, and old Celtic tunes that crossed the Atlantic Ocean with the American immigrants that settled this place way back when. Also, I'd be very remiss were I to fail to point out that Flatpicking Guitar Magazine IS a magazine that you can subscribe to, and that it is simply one of the finest resources for instruction material for flatpicking guitar that is available. The staff is full of people who are well known and well renowned for their skills, and all levels of player will have instruction material in every issue - from beginner level all the way to tab and music of pieces that only the most skilled can play up to tempo. The above is the home page to Flatpicking Guitar Magazine online, and it's a fine site, and a fine magazine too. It was started by a man named Dan Miller, and I've personally had a subscription in the past, and would like to have one again. I'm just broke, is all. Yes, I've met Dan Miller, and more than once - same as with Dan Crary, Steve Kaufman, and who knows how many other flatpicking guitarists - all at Winfield, Kansas and during the Walnut Valley Festival. Just like any good social networking site - the site has various groups and blogs and forums, and the ability to have "friends," and upload pictures and videos. It's a fine site. I go there to watch some videos that someone uploaded of themselves at home - and to ...basically view the world of amateurs to pros who have profiles there, and see what's going on in the world of one of my favorite art forms. I've met Dan Crary, and on more than one occasion too. No, he in no way in a million years would ever recall the name of Wesman Todd Shaw, and nor should he. I doubt that I ever gave him my name - I was pleased to be talking to the man in the first place, and more than a bit intimidated. You see, to me, Dan Crary is a bit of legend. He's one of the founding fathers of flatpicking the acoustic guitar. What is flatpicking? It's simple, it's just playing Celtic oriented tunes that originated on either the mandolin or the fiddle....the violin, but with a pick, and on a steel string acoustic guitar. Where did I meet Dan Crary? Well, the best place to meet Dan is to ...be one of his students, he's a professor of communications at UCLA; but that's not where I met Professor and Musician Dan Crary - I met him, multiple times, in different years - at the Walnut Valley Festival, in Winfield, Kansas. The Walnut Valley Festival is Americas biggest traditional music festival, and it's held the third week of September, and every single year...in Winfield, Kansas. I've been three times, and I've talked to Dan at two different WVFs. Let's give Dan a Listen, shall we? We shall. Don't know the year of this - but it's definitely a performance at a Bluegrass or Folk, or Traditional music festival - and it's possible that yours truly saw this very performance with his own two eyes, and even got to field some questions afterwards, as Professor Crary, and friends will often take questions after their performances at such ...personal venues and gatherings of like minded, non traditional types as one finds, enjoys, and loves at music festivals not ....the least bit corrupted by the satanic entity of mainstream American mass media. I know that you can't really tell, but trust me on this - Dan Crary is at least six foot six, and possibly several inches taller than that. I've no idea how tall he is - it doesn't matter, but if you happen to ever meet the guy, and you happen to be like me, about five foot nine inches - the size of the guy is shocking, as you'd just not expected that he'd be that tall. If you're an electric guitarist, then you possibly have no idea how difficult it is to play so well on a steel string acoustic guitar. Typically, the pick hand wrist of an electric guitarist isn't nearly strong enough to provide the volume necessary to ....be the least bit appreciated for someone wishing to hear FLATPICKING. Dan Crary is a natural instructor, and probably is so for everything he knows and is willing to teach. He's provided column after column of guitar instruction for various and sundry publications and monthly guitar magazines for....my entire life as an amateur guitarist, or acoustic guitar music fan. At this time I have no Youtube videos of myself to show anyone - I don't have the equipment for such - but I can tell you that without ever having tried to arrive at this....I have the exact same right hand picking technique as does Dan Crary - and it's "the wrong way to do things." Doesn't that imply that there is a "right way to do things?" Yeah, me saying that my own technique is wrong implies that there is a right way, and also implies that I'm so daft as to presume that Dan Crary's technique is faulty. He and I anchor our right palm, lightly, on the bridge of the guitar - nobody will ever advise someone learning to play the guitar to do that, and I wouldn't myself ....guess I already included myself with words such as "nobody." Ironic. In the above video you can see more legends of flatpicking than are typically seen in one setting. I've also met Steve Kaufman one more than one compassion, but that's another story altogether. The video above isn't perfect, the sound is rather flawed - and it's ironic to me that Tony Rice, and Doc Watson both seemed to have been slighted so far as the quality of sound was concerned here. Dan Crary mostly plays Taylor guitars, and has had Bob Taylor build him a few to his personal specifications....no, I've not met Bob Taylor....but I've sat and listened to him talk while I was in the audience...quite a few times. If you'd like to hear Dan Crary, master of communications talk a bit, then here you go! The man has a HUGE booming voice...he damn near needs no amplification at all. The Taylor 810 is the Martin D 28's number one competitor in the US market for a full sized, solid wood construction, rosewood and spruce guitar. ....and I don't care what the Martin nuts, or anyone else says about Taylor guitars - they DO compete, and they do it very, very well. I do NOT consider this guitar to be a copy of a Martin D 28, it's dimensions are different, and Taylor has it's own unique bracing system, and so their guitars are voiced differently than are Martins, and they do have their very own unique tonal characteristics (as do, in fact, every single last guitar ever made...) - and folks like myself can actually hear the difference between a Martin and a similar or competitive model by Taylor. I've known about Taylor guitars for quite some time - longer than this guy who's put together this website that I'm going to link you to, but I do like his site, and ....basically, I just already like people that like acoustic guitars! Now, I truly like this little clip up above, this guy is playing a fine old traditional blues tune that lots of folks play, but is especially associated with Doc Watson. This guy isn't showing off himself at all here, he's playing at a very reasonable temp, playing loud and clear. I think he's showing off his guitar, and as awesome as his Taylor 810 sounds - hell, I'm showing off his guitar too! Now the Taylor 810 is a rosewood body, spruce top, and mahogany neck dreadnought of all solid wood, fourteen frets clear of the body - and with various and sundry combinations of rosewoods and spruce available - but as is standard for D 28 style guitars these days, we're primarily talking about Sitka Spruce, and East Indian Rosewood. You can always identify a Taylor guitar by their distinctive pick guard shape, and by their trademark head stock shape - very fine instruments, one and all. I'm finding new ones for just under three thousand dollars. Most Taylor guitars come with Fishman electronics - basically, they're ready to plug in, or play acoustic. Obviously, if you find an older one that is Brazilian rosewood, or one that was custom ordered with a rare species of spruce for a soundboard - the prices will go higher. Whenever someone asks me about buying used guitars - I tell them to find the ugly scratched up one that's got a straight neck, and sings like an angel - I'm into tone and play-ability -cosmetics or beauty on an instrument is just icing on a cake.